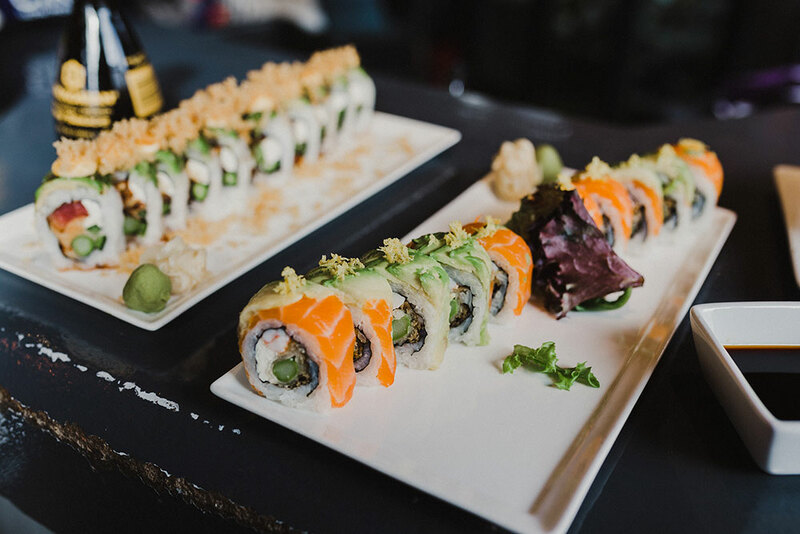 In the Raw offers a mixture of the traditional options that sushi connoisseurs adore — everything from classic tuna rolls to fresh water eel to spicy yellowtail — as well as more creative choices for the more daring diners like mussels, squid, octopus, and plenty more. If it’s aquatic, In the Raw probably serves it. And you can order it either at the sushi bar or at a table, depending on how you feel like dining. Specialty rolls are also available, and as sushi lovers know, that’s where a menu can truly shine. Among the numerous sushi rolls to sample are the Jobe (tempura shrimp, crab, asparagus and eel topped with tuna, yellowtail, salmon, and avocado); the Restless Ribbon (shrimp, salmon, crab, and avocado, rolled in sesame seeds); and the extravagant 6151 (crab cake, cream cheese, jalapeno, and asparagus, rolled in masago, and topped with a 6-ounce lobster tail). And that’s just the short list. 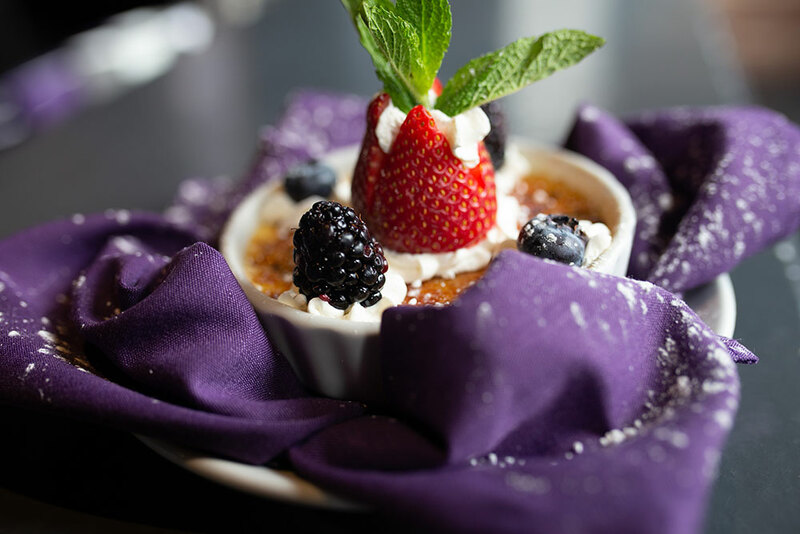 Their 8-ounce pepper filet, served with out-of-this-world wasabi mashed potatoes and killer asparagus, all topped with a rich portabella demi-glaze sauce, will make you forget everyone else in the place is doing sushi. In the Raw isn’t your usual sushi place. Instead of black and red decor, there are exposed brick walls. It’s edgy and trendy and hip. The ambiance is not so much quiet and soothing as it is vibrant and cool. 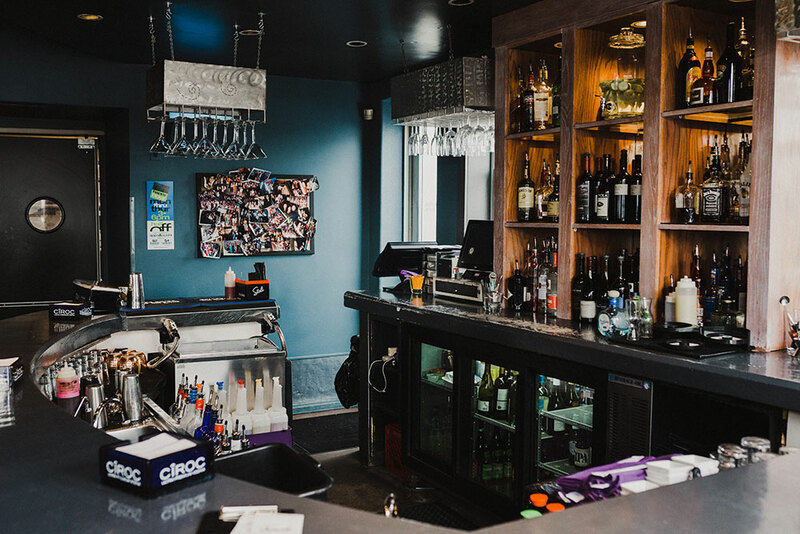 Six years later, Hughes opened the On the Hill location. The In the Raw menu continues that edgy, nontraditional feel, keeping up with trends, while always maintaining quality. Of course, you can get your favorites like California rolls or salmon skin rolls, but you can also get a wrap, a rice bowl, or ramen as well as some truly creative flavor combinations in roll form. The Dunwell roll — paying tribute to In the Raw’s Brookside home — is a consistent favorite item. It starts with crispy tempura shrimp and adds jalapeno, cream cheese, and a spicy sauce. The cream cheese is a smooth foil to the heat of the jalapeno and sauce. Another favorite is the Ginger 2 roll (yes, there’s a Ginger 1), filled with crabcake, cream cheese, blackened tuna, asparagus, jalapeno and topped with avocado, crunchies, habanero sauce, and sweet eel sauce. If you were wondering, the Ginger 1 roll has smoked salmon rather than tuna and avocado rather than asparagus. 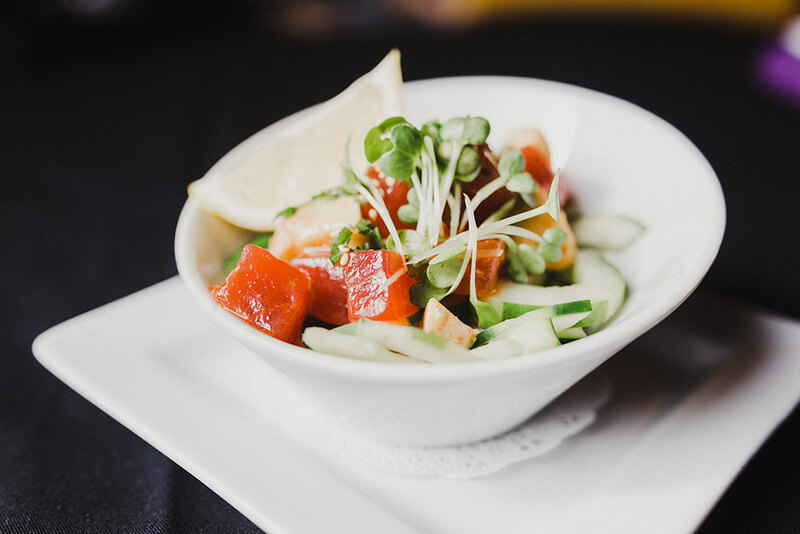 For a quick and tasty treat to start your meal, try the ahi tuna poke bowl. Bite size chunks of ahi tuna are seasoned and topped with sesame oil. The ahi is fresh and firm and perfectly seasoned. It sits on top of avocado chunks, cucumber slices, and more. 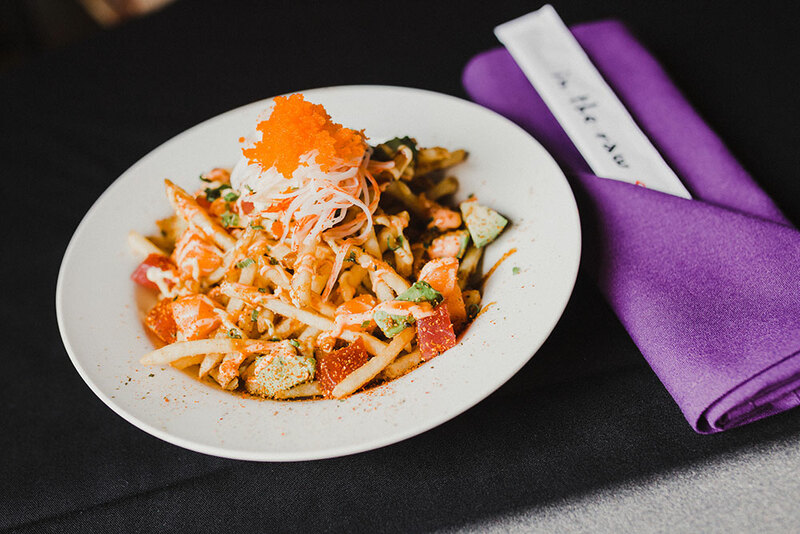 You can also order this fresh starter with salmon poke or with shrimp. The Volcano roll is a top seller. 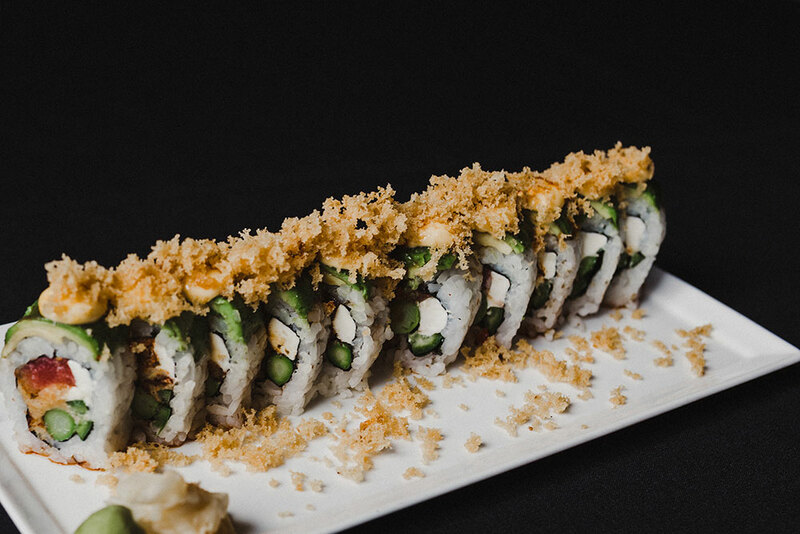 This high-end roll is stuffed with tempura shrimp, cream cheese, avocado and jalapeno, and topped with scallops and scallions sautéed in a spicy sauce. 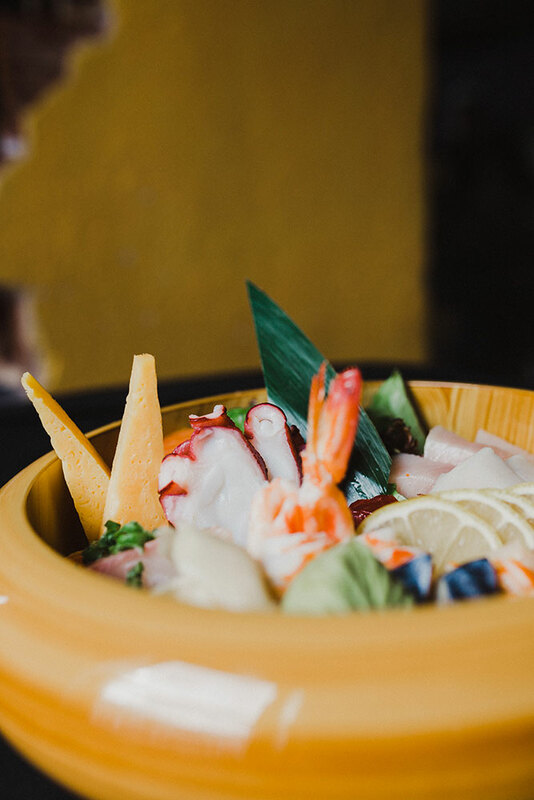 Another great choice, especially if you want to sample the seafood offerings, is the Sashimi Eleven bowl. It’s a beautiful presentation, full of salmon, tuna, octopus, shrimp, tamago, and more. The fish is served in meaty chunks that beg you to pick up your chopsticks and go old-school with it. The ITR salad is one of the most popular items overall. Roasted chicken tops shredded lettuce with crispy noodles, wontons, toasted almonds and scallions. The whole thing is tossed with In the Raw’s signature ginger vinaigrette. It will only take one bite for you to know why it’s a favorite. While In the Raw’s nontraditional take on sushi is great, don’t neglect their hot items. Their pepper filet may be one of the best steaks you can find in Tulsa. It’s an 8-ounce filet served with wasabi mashed potatoes, asparagus, and a portabella demi-glaze. You can add three tempura shrimp or a lobster tail for a surf and turf.